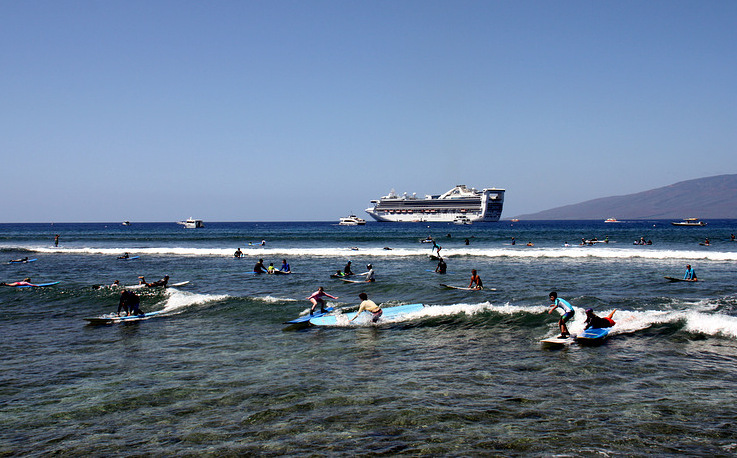 Our goal in taking a month-long cruise around Hawaii and Tahiti on the Golden Princess was to experience – and then write about – how a major cruise line like Princess caters to its suite passengers. It was one of our most enjoyable projects. 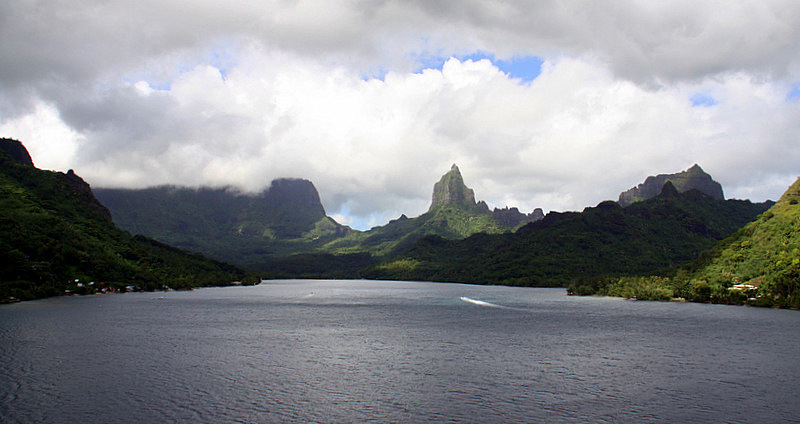 © Travel Photo Interact – Place your cursor over any photo to enhance it – click to enlarge. We started our adventure by renting a car in San Francisco and dropping it off in Lomita, just south of Los Angeles. We caught a taxi to San Pedro; it was there we boarded the Golden Princess. 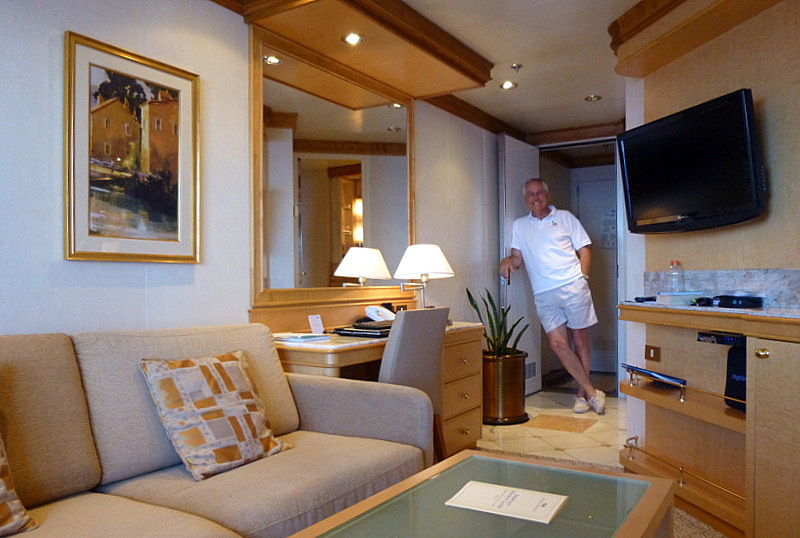 Over the past ten years, we have photographed and written about suites in B&Bs, hotels, resorts, and on cruise ships. It is our writing practice to always consider our subjects from a “couples” perspective. In that light, we have found many suites to be overly expensive or disproportionately large for two people. 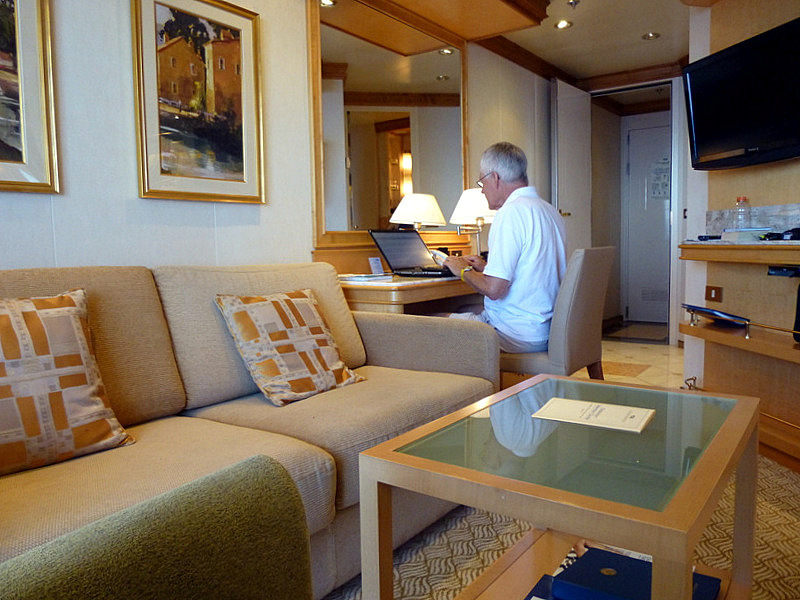 However, on the Golden Princess, we found a group of full-size suites that were not only luxurious, but the perfect size for two people on a cruise of any duration. 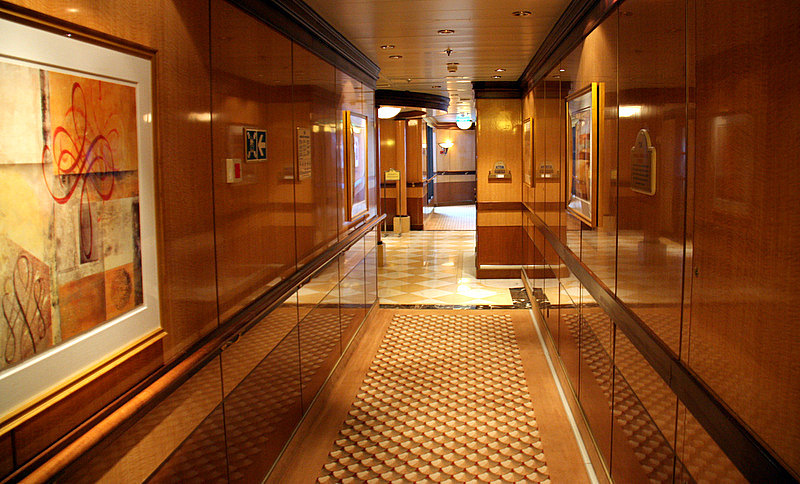 After boarding the Golden Princess, an elevator whisked us up eight levels to the Sun Deck where we were escorted along an elegant wood-toned hallway to the Palermo Suite – our home for the next 28 days. 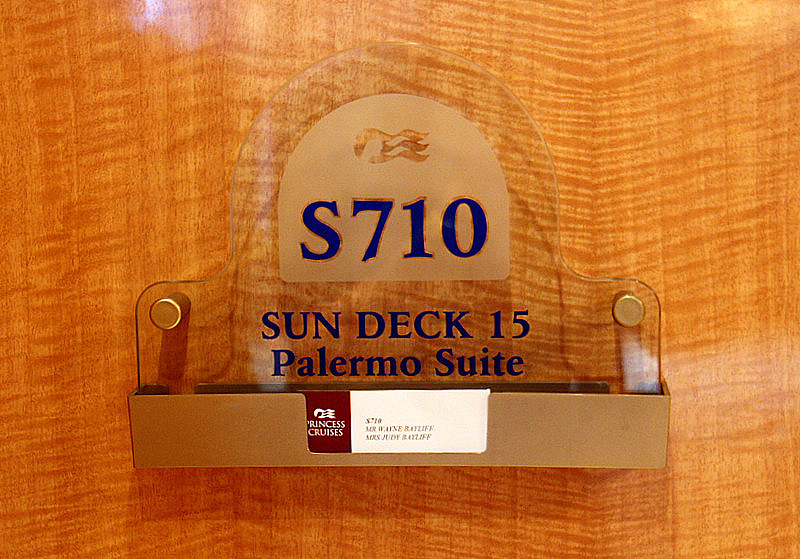 The Palermo Suite, was one of ten new suites added to the Sun Deck of the Princess during a 2009 revitalization. There are two entry doors to the Palermo Suite, with a small barrier foyer between. The second door acts as a noise and privacy baffle. Upon entering the living room we were immediately impressed by the polished marble floors and shinning granite counter surfaces. The walls and ceilings in the Palermo are a mixture of delicately textured golden earth-tone material and light natural woods. Light fixtures and other suite features are of brushed stainless, and the suites well-chosen art is framed in a soft muted gold – perfect for the elegant and airy setting. The living area can be separated from the sleeping room by floor to ceiling privacy drapes, and there are large flat panel TVs in both chambers. The living area TV also has a DVD player. Guests can select from a library of recently released or vintage movies, and they are delivered right to your door. The bedroom has an ever-so-comfortable Queen sized bed, which can be made into two twins, and the wooden ceiling vault houses a handsome alabaster dome that illuminates the room in a warm and subtle glow. 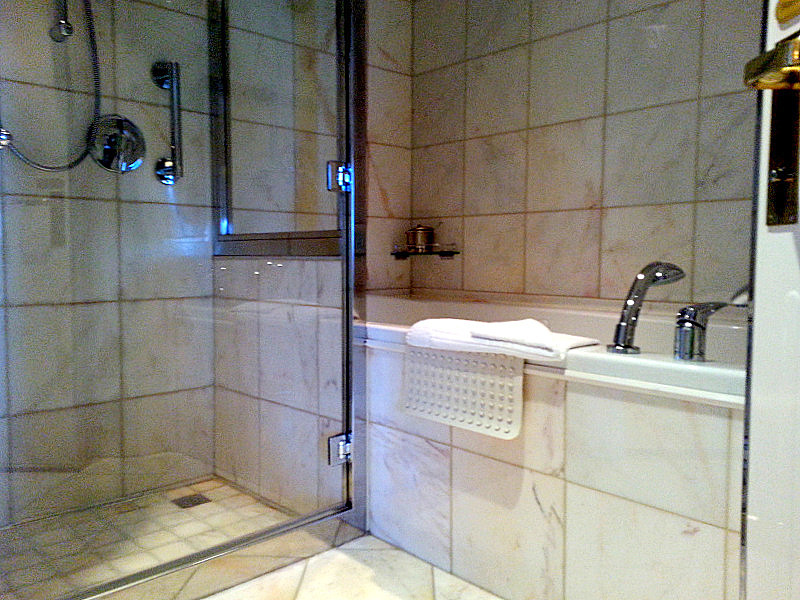 Bathrooms on cruise ships are not noted for their spaciousness. 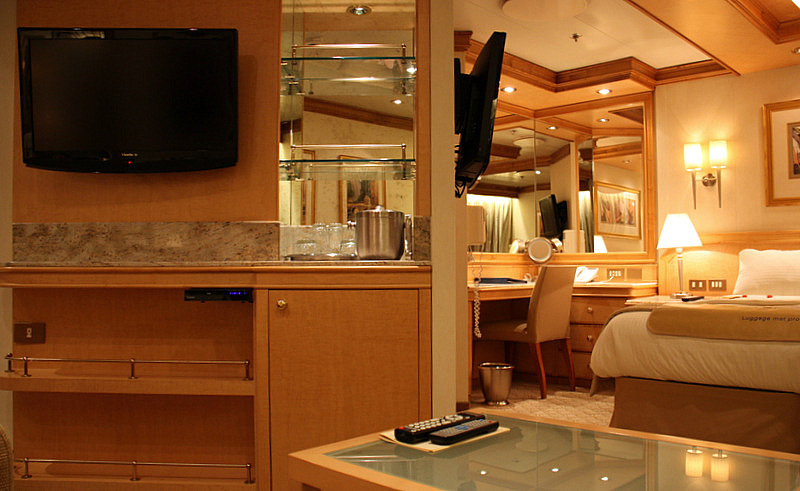 However, this style of suite on the Golden Princess offers a sink and toilet room, and another room for a large marble shower and a separate full size soaking tub. 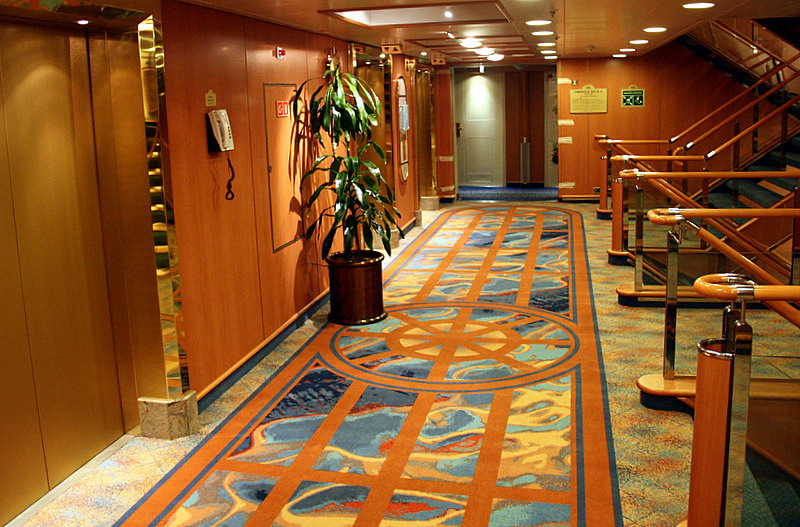 A spacious walk-in closet and an electronic safe are also nice amenities for a long cruise. 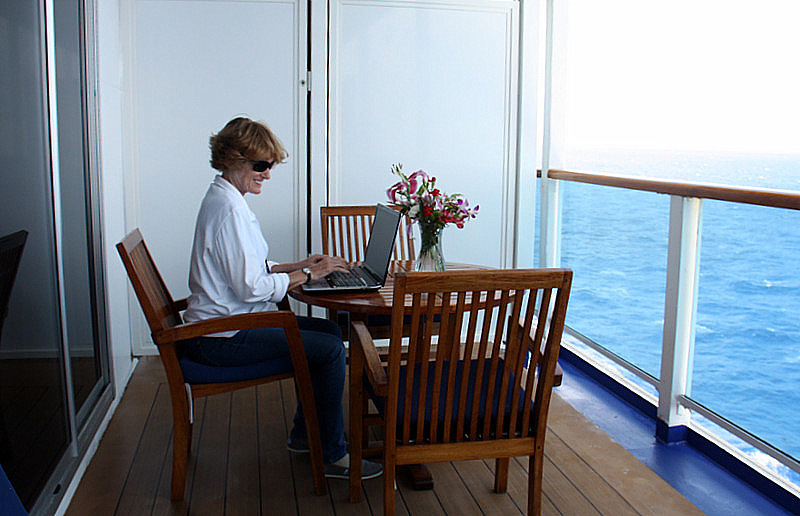 Most couples are not working on computers while on a cruise, but we particularly liked having two granite-topped work spaces for the purpose. Handily, one space was also a well-lighted vanity with multiple mirrors – such a help when preparing for an evening of exquisite dining and entertainment aboard the Golden Princess. Two sets of floor to ceiling sliding doors provide extraordinary changing views of the islands, and two finished teak deck lounges make for excellent conversation, private reading, and contemplation at sea. The first mini-bar setup is complimentary, and the premium upgrades include fresh flowers, delicious canapés, and special bath amenities. Also, one small, big thing – electrical outlets. Plugs for your electric devices are as rare as Indian Head Pennies aboard cruise ships. Being able to plug in only two devices in a stateroom is normal. In the Palermo suite we had eight outlets. Electric Valhalla! The Palermo Suite, along with its nine siblings (Corsica, Florence, Grenada, Malta, Pisa, Provence, Sardinia, Seville, and Tuscany) are not the largest suites on the Golden Princess, but we found them to be a perfect accommodation of size, layout, and comfortable décor for a vacationing party of two. 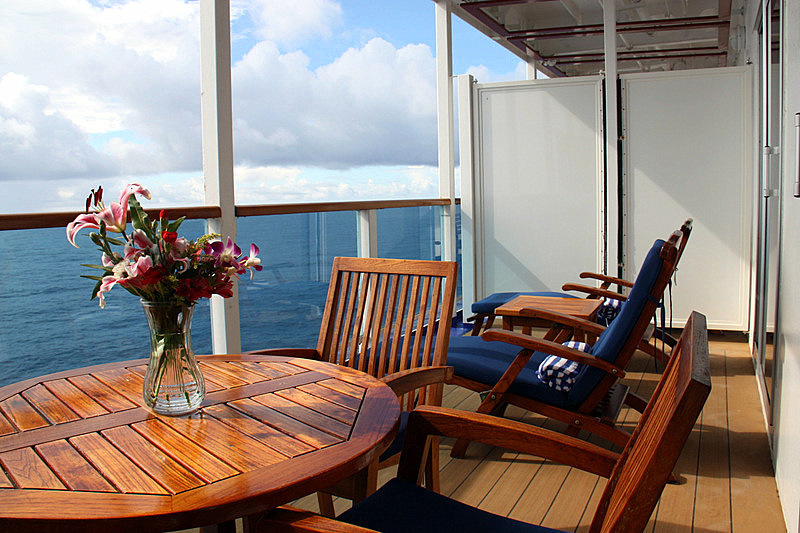 All in all, the full-size Palermo Suite has about 600 square feet of living space, including the balcony. 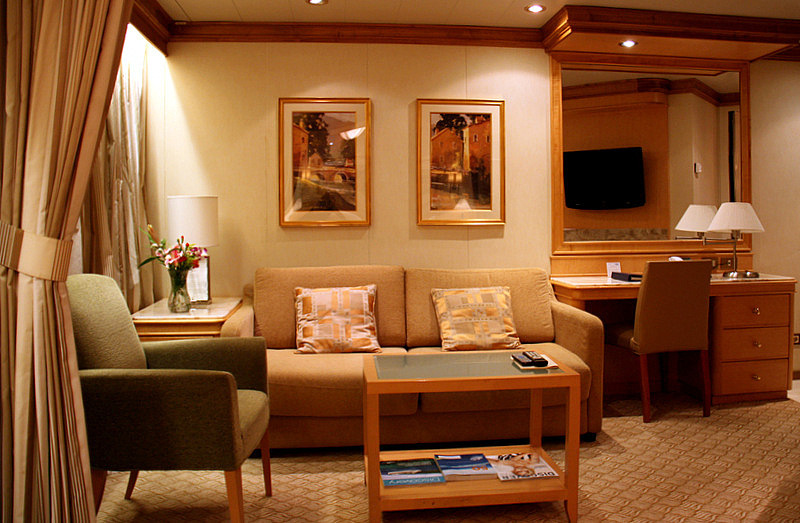 As a comparison, a mini-suite aboard the Golden has approximately 323 sq. 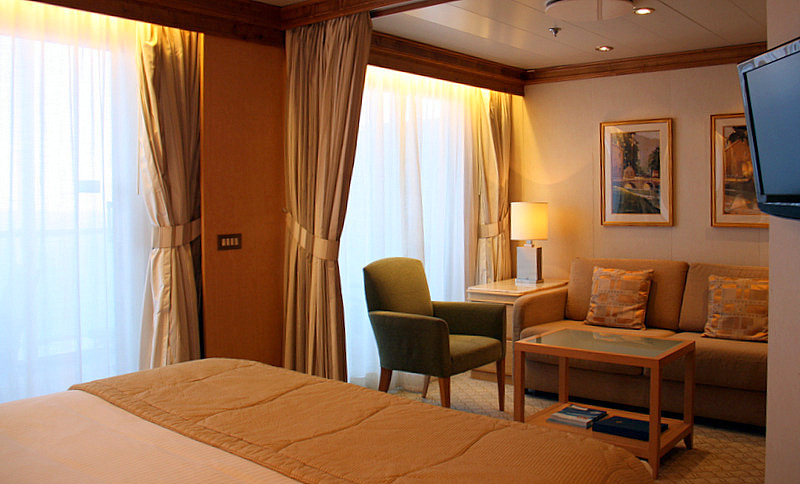 ft., and a balcony stateroom about 250. 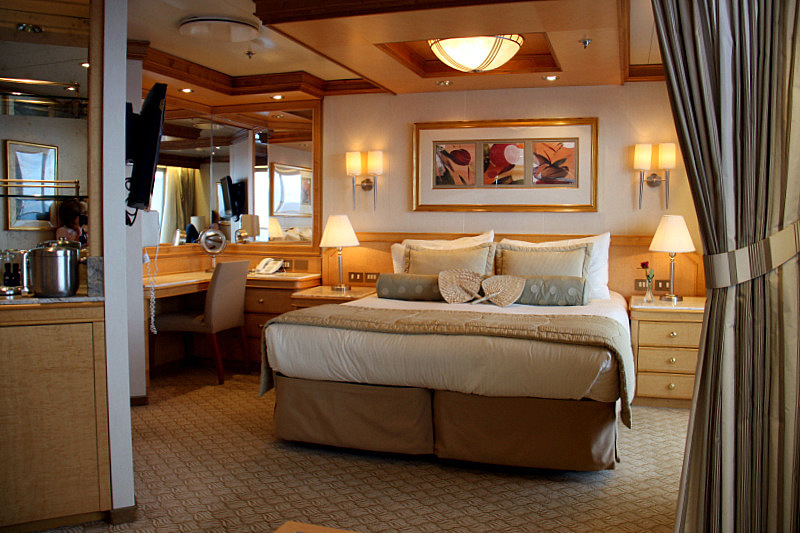 Those that occupy the luxurious full-size suites on Princess ships enjoy amenities and privileges not afforded other passengers. After completely reading this article, you may decide that the roominess of a suite along with the following additional niceties, are sufficient reasons to consider reserving the best accommodations your budget will allow. 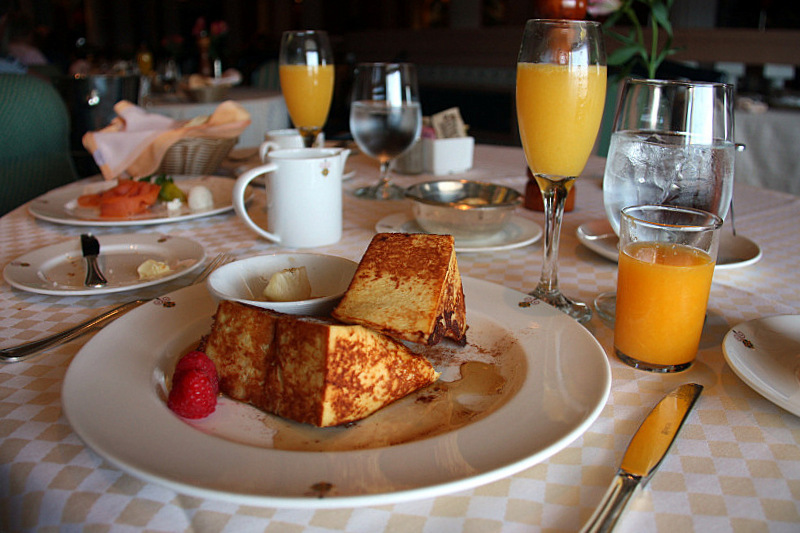 One of our favorite Princess full-suite perks is the exclusive and private dining breakfast at the Sabatini’s restaurant. 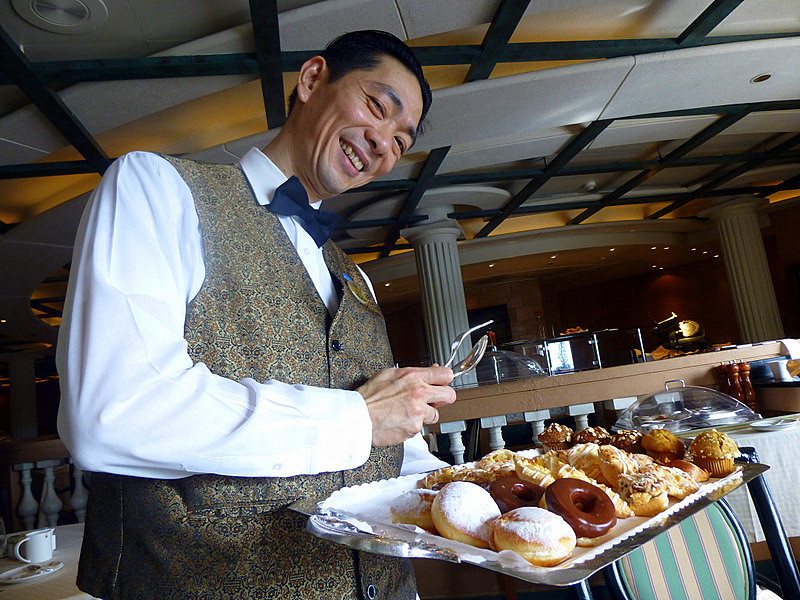 Every morning, the Sabatini’s is transformed from an elegant Italian dinner eatery into an exclusive breakfast retreat for the passengers that occupy the 30+ full-suites aboard the Golden Princess. However, not all suite guests take advantage of the Sabatini’s privilege; some prefer the ultimate personal option of suite room service, while still others choose one of the conventional dining forums like the Horizon Court Buffet above. 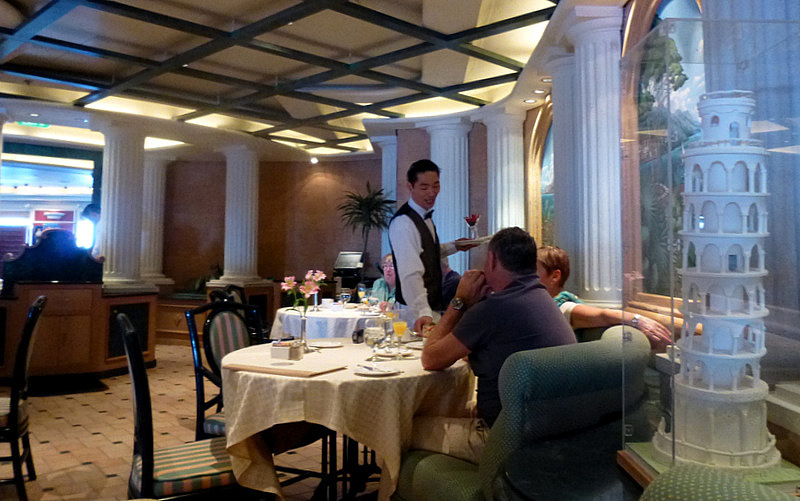 The limited number of tables in the Sabatini’s provides an intimate setting for a quiet breakfast. 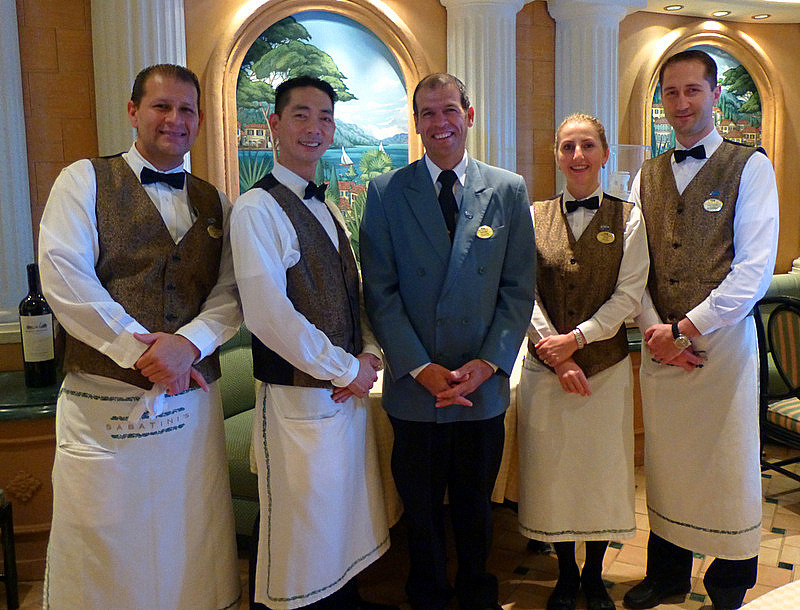 An exemplary staff of four waiters is orchestrated by a congenial Head Waiter who greets and seats each arriving guest. Food is prepared by three cooks supervised by a Chef de Cuisine. 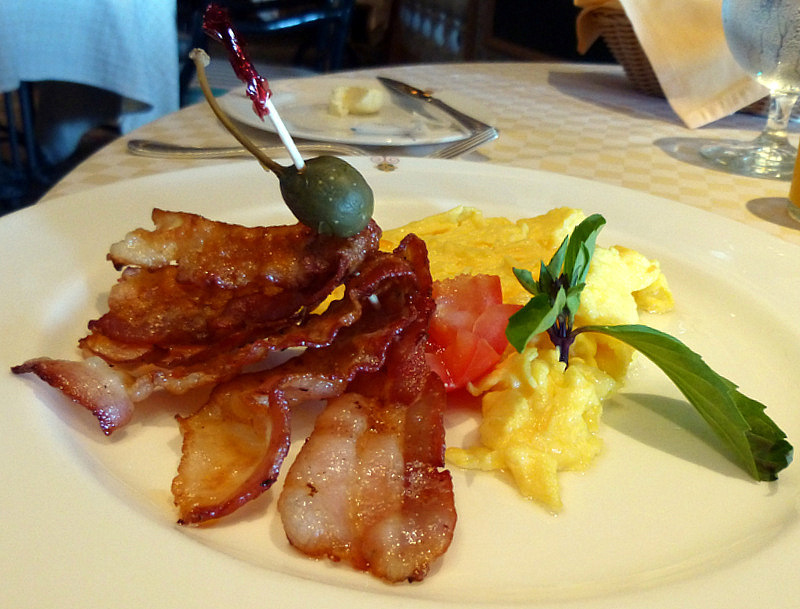 The Sabatini’s Breakfast Menu includes everything imaginable for the morning meal, carefully prepared and skillfully presented. 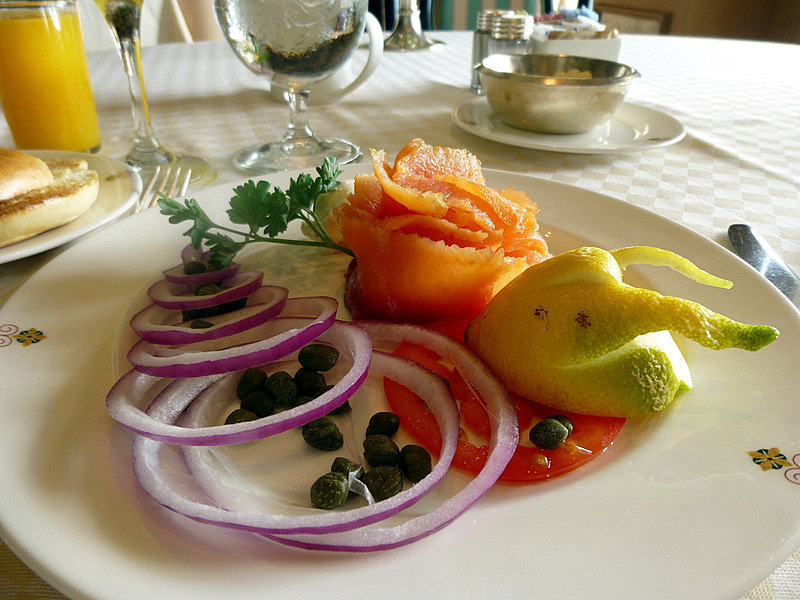 The artistic presentation may change with the muse of the chef – but is always to the highest culinary standards. 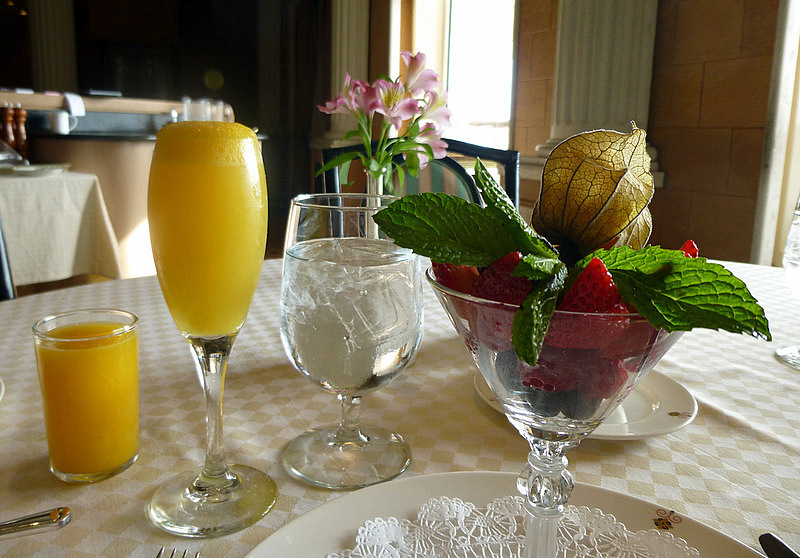 We generally started out with a wake-me-up Mimosa and freshly squeezed orange juice. That was usually followed by a delicious decaf Cappuccino and a warm-to-the-touch baked mini-pastry and a chilled stemmed glass of hand selected berries. For our main course we picked from a unique assortment of waffles and French toasts, and the usual varieties of fresh eggs, such as Benedict, omelets, scrambles, etc. 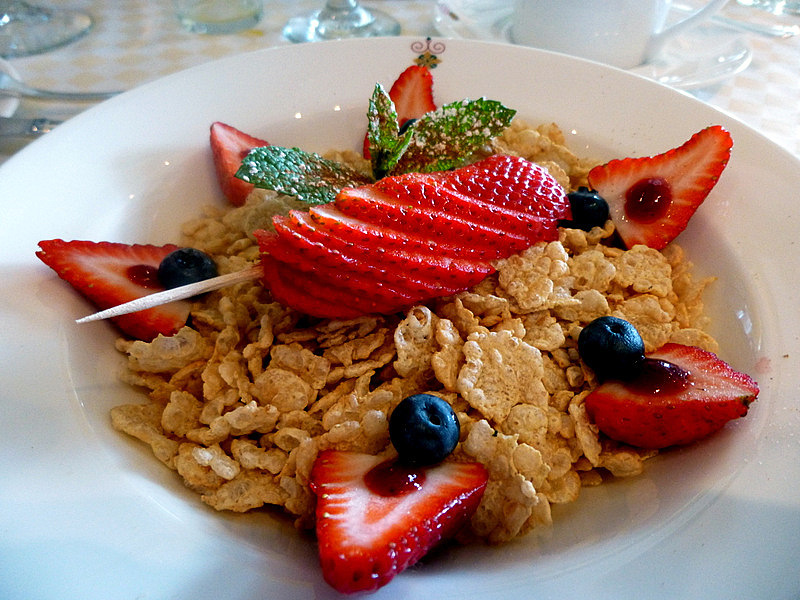 Even simple cereals are brilliantly presented in Sabatini’s. 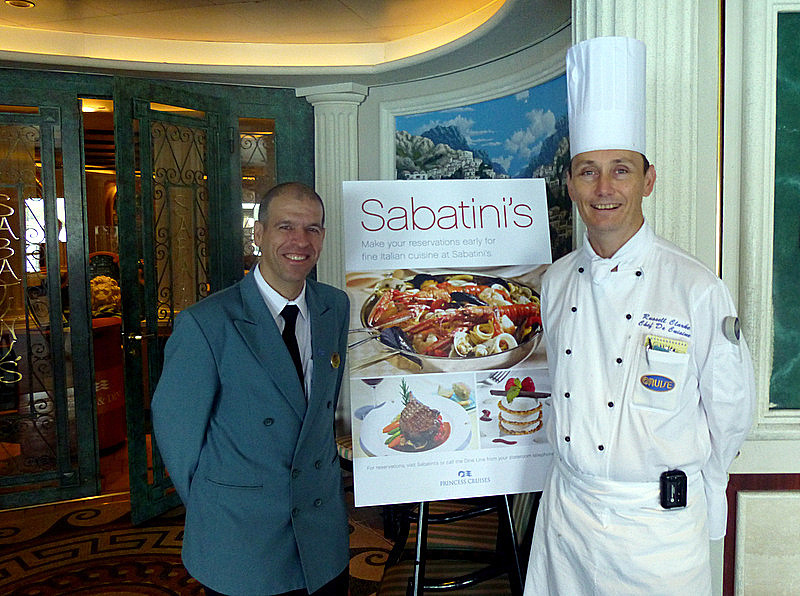 Found only on Princess ships, the Sabatini’s restaurant is a specialty Italian restaurant that is open every night to all passengers. There is an additional charge for dinner dining in the stylish and intimate Sabatini’s, but well worth it to celebrate a special occasion – or simply to enjoy truly outstanding Italian cuisine. In many ways, Preferred Boarding can be equated to waiting for an airline flight in a private lounge instead of the communal terminal. 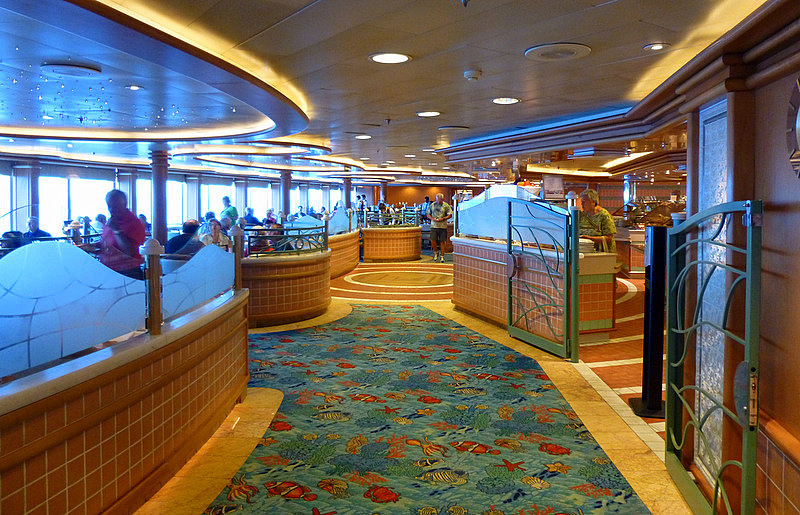 Preferred boarding means you are the first passengers to board the ship at embarkation, therefore among the first guests to be settled into their stateroom and afforded early access to the delicious buffet that awaits oncoming passengers. There’s always plenty of food for all, but it is a comfort to be at the front of a line, is it not? 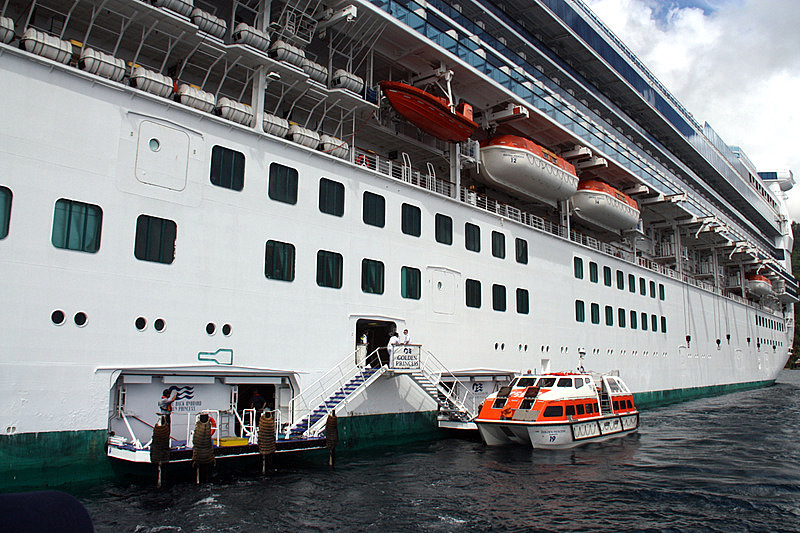 Three of the nine ports we visited on our cruise required being tendered to shore. For those not familiar, this is a procedure where the cruise ship does not dock, but rather anchors offshore, or remains stationery away from the land. The act of tendering is very organized, and within a short time a few thousand people can be transferred to the shore with relative ease. 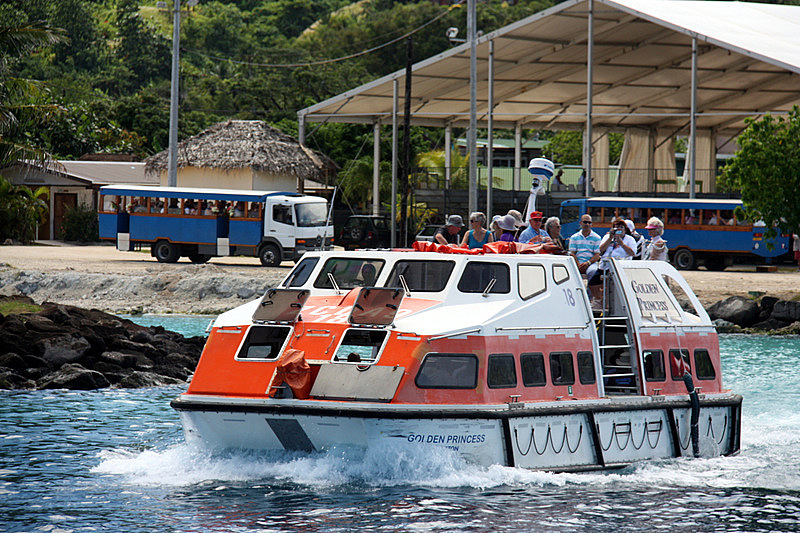 While general passengers are issued group numbers on a first come first served basis, and comfortably wait for their group to be called to “tender,” suite passengers are afforded a privilege that allows them to board the next available tender, therefore getting them to shore a bit earlier to enjoy the port. Although laundry and dry cleaning services are available to all passengers for a reasonable charge, full-suite guests are provided the service as part of their complementary privileges. 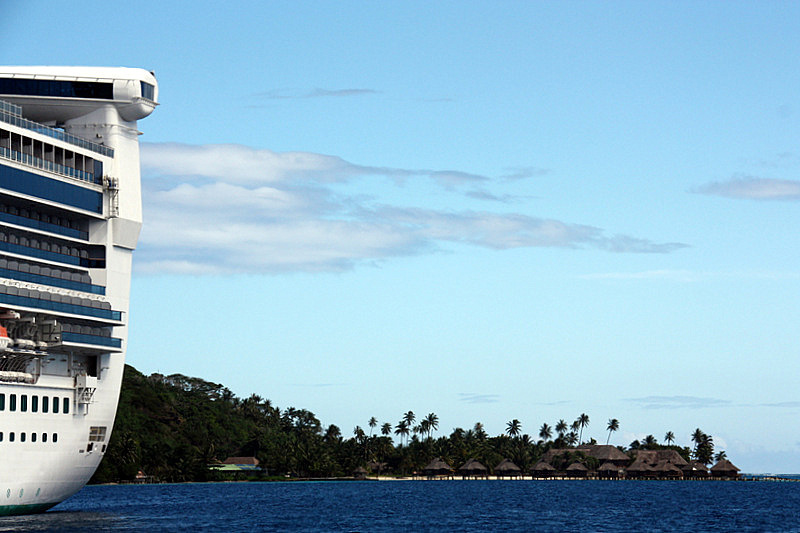 Should it be your preference, there are also self-service laundry facilities throughout the ship for all passengers. 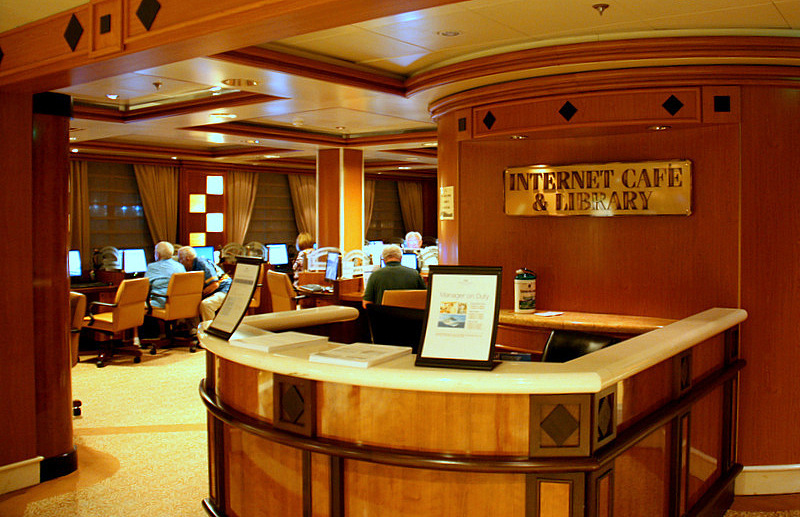 For those suite customers who want to keep in contact with the world while at sea, there is a suite internet program for use either in the Internet Café or from any part of the ship when a personal wireless device is used. 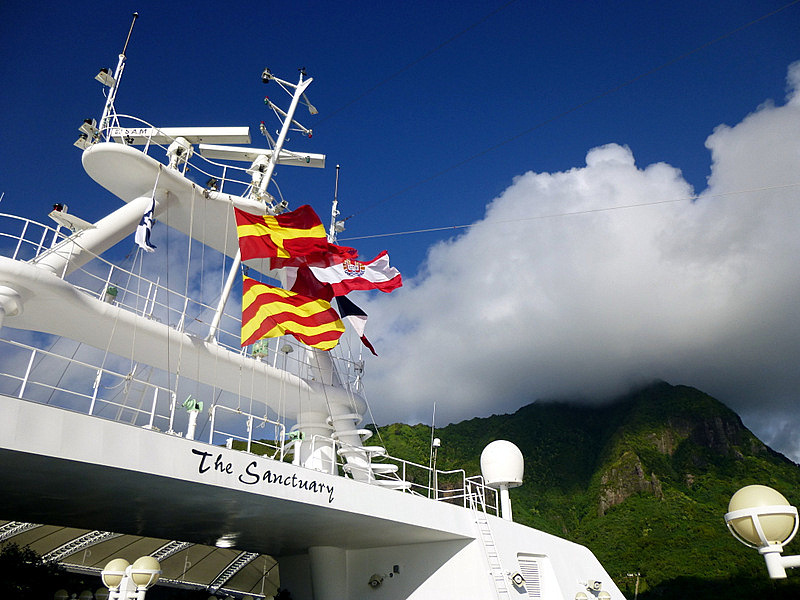 During our month long cruise on Princess we noted a consistent level of excellent service for every category of passenger aboard. 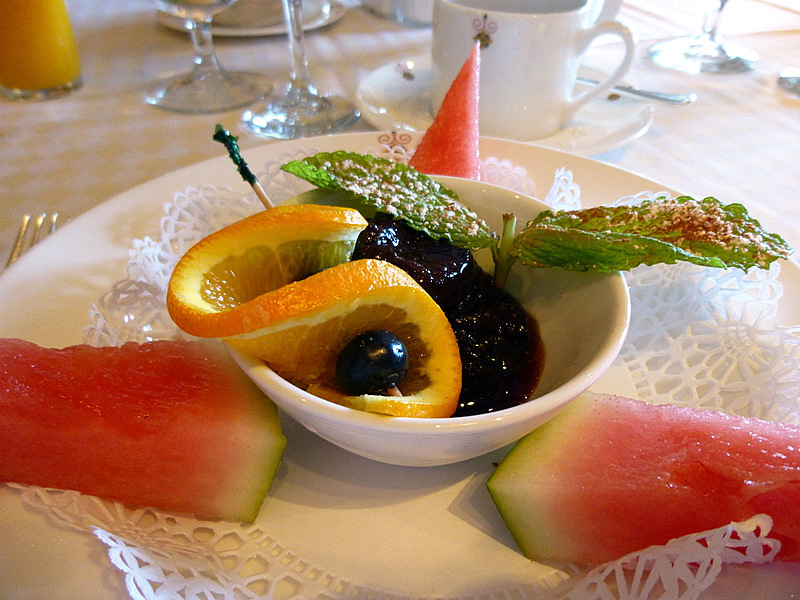 But, the additional perks afforded suite occupants, made a most pleasant journey that much more elegant and enjoyable. Our recommendation – do it if you can. You only live once, and how suite it is! 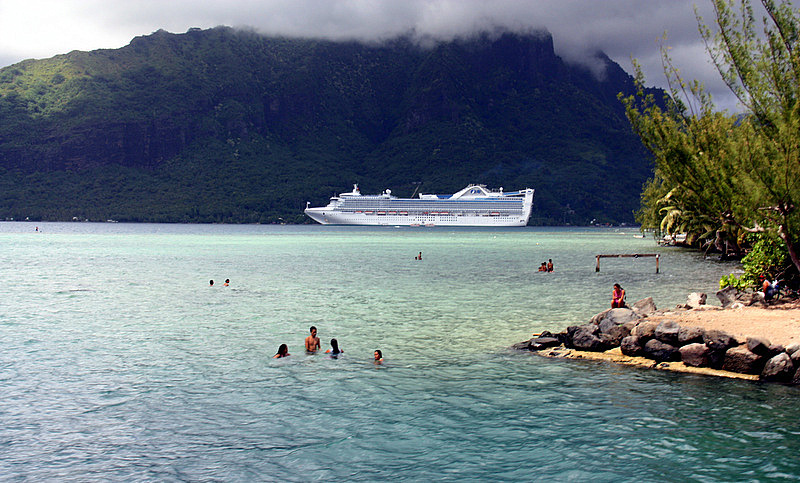 More stories about our 28-day cruise to the South Pacific on the Golden Princess will be forthcoming. For more information about the Golden Princess check out the PDF file *here* For additional information about booking a cruise on Princess look at their website at www.princess.com or call your favorite travel agent.